November 2017 – DAMIEN ENGLISH T.D. 21st November 2017 at the Royal College of Physicians, Kildare Street, Dublin 2 @ 13:00. Michael John, Clean Coast volunteers, distinguished guests, ladies and gentlemen. It is my very great pleasure to be invited here today to present the 2017 An Taisce’s Ocean Hero Awards and I hope that you enjoyed the range of excellent and interesting contributions which were presented here this morning. Events like this provide a great opportunity to build networks and share experiences and most importantly, honour the invaluable contribution that Ireland’s coastal communities have made towards conserving our spectacular coastline. For an island nation with one of the largest maritime areas in the European Union, the importance of the sea to Ireland cannot be overstated. We deeply value our marine and coastal environments in all their beauty and diversity, but increasingly we are aware of the growing threats from human activities that face complex marine ecosystems some of which remain unknown to science. In this context, litter accumulating in the marine environment is a significant environmental issue facing the World today. The exact quantity of litter, including plastic in the ocean and volumes entering the ocean from waste generated on land or lost or discarded at sea is unknown and is the subject on ongoing extensive national and international research. Estimates vary widely, but there is no doubt that it exists in vast quantities with undetermined impacts and that levels of marine litter are growing at an unacceptable rate. My Department is committed to working, both nationally and internationally, with our EU and OSPAR partners and national stakeholders, to determine the key sources of marine litter, the pathways by which it can enter the marine environment and the harm it causes. This will inform the development of our national and international measures to address the problem. Ireland is already implementing a suite of measures identified in our Marine Strategy Framework Directive Programme of Measures to address this issue. This will be reviewed and updated on an ongoing basis as new marine litter sources and pathways are identified. Ireland will also continue to identify ways of treating plastic waste as a resource. Ireland also supports the aims of the Plastics Strategy in the Circular Economy which aims to address the challenges posed by plastics across the value chain and take into account the entire life cycle. The implementation of programmes such as the Circular Economy package will, I believe, be a key measure in reducing marine litter inputs in the future. Because of the transboundary nature of the problem, Ireland continues to cooperate collaboratively with international partners to try and identify the extent and impact of the problem and to develop solutions to address the issue in tandem with our EU partners under the Marine Strategy Framework Directive and the OSPAR Convention for the Protection of the Marine Environment of the North-East Atlantic. However, the problem of marine litter remains a particular focus for us at this time. It is also worth noting that exciting developments are ongoing in relation to the Green Schools module on marine environmental issues, especially litter. This is also administered by An Taisce and supported by my Department. It was piloted in a number of schools in 2016 and is currently being rolled out, on a nationwide basis, involving over 250 schools. I am convinced that this internationally ground breaking module will augment and dovetail with the current suite of green school offerings and will further educate the children of today and improve the environmental behaviours of tomorrow. We regard these programmes as international best practice models and are keen to present them as such to our international partners in the EU and further afield. In recognition of this fact, the Government has committed to continue to support the Coast Care and Green Schools Global Citizenship Marine Environment programmes into the future. At the “Our Oceans” Conference in Malta in October, Irelandundertake to incorporate these initiatives among our formal measures to address the marine litter and environmental protection targets of the UN Sustainable Development Goals. But today is about you, the Coast Care groups, Businesses, Schools and individuals, who give of your time and energy to make the marine environment a better place. The contribution of local communities and community based enterprises cannot be overstated. Your efforts are crucial in achieving and maintaining the aesthetical appeal and the amenity and economic value of the coastal resource. The work of coast care groups is actually making a tangible difference to the quality of our coastal environment, removing nearly 200 tonnes of litter from our coast annually. As well as environmental benefits, this has tremendous social and economic benefits, not least for our tourist industry. I understand that there are over 600 active Coast Care groups, involving 18,000 volunteers, and representing a quarter of a million hours are dotted around the Irish coast. Your tireless activities, augmented by environmentally focussed enterprises and schools are both civically admirable and environmentally beneficial, and are rightly being recognised here today. Attaining Ocean Hero awards does not come easily. It requires a lot of commitment, a lot of effort and a lot of civic spirit, which makes the achievement all the more satisfactory and recipients here today should be justifiably proud of their achievements. These awards are a tremendous example of community school and business collaborations and local and individual pride harnessed for the improvement of the marine environment. I think that the recipients here today, in the various categories, should feel enormously fulfilled in achieving these hard-won and much-sought-after accolades. We, as current custodians of the marine environment have a duty and a responsibility to pass on a resource to be sustainably developed and enjoyed by future generations. But there is no room for complacency and as a society, we need to redouble our efforts in identifying and implementing environmentally sustainable solutions to current and future environmental challenges. So, in conclusion, I hope you had a thought-provoking and enlightening seminar and I hope that you had an opportunity to share information and experiences over lunch. I am confident that, with the help of marine conscious stakeholders, like yourselves, that we are well positioned to deal with the significant environmental issues ahead. It only remains for me to congratulate all those who have been nominated and will receive awards here today. You deserve recognition for the trojan efforts that you have made to help improve the quality of the marine environment. Go raibh maith agaibh agus comhghairdeas. Ladies and Gentlemen, entrepreneurs of County Meath, it is a great pleasure to be in Trim for the 4th Annual Meath Enterprise Week Business Conference and Expo. I would like to pay tribute to Gary O’Meara and his team at Meath Enterprise for continuing with this showcase event that brings together the very best of Meath Entrepreneurship under one roof. This year’s conference theme of ‘Collaboration, Innovation and Entrepreneurship’ encapsulates the essence of what it takes to bring an idea for a product or service from inception right through to the market. But it is the ‘Innovation’ aspect of the expo that excites me the most. Innovation is nothing new to Meath. Innovation is not just driven by bright ideas, innovation is driven by entrepreneurs, who take great ideas and bring them to life as new products, new services and new businesses. Five thousand years ago Meath was at the cutting edge of innovation in Europe. The best Scientists and Engineers in Europe, in the world, were working to build the megalithic structure at Newgrange. That building was precisely aligned to flood the inner burial chamber with light at dawn on the shortest day of the year and demonstrates just how innovative and skilled our remote ancestors were. The factors which led to the creation of Western Europe’s first innovation hub in Meath, location and connectivity, a highly skilled workforce and a great quality of life, are still present in the county. In point of fact they are stronger than ever. My vision for Meath, a vision shared by Meath Co Council, Meath Enterprise and business in Meath is that Meath will not just be a great county to live in, but a great county to work in & to invest in. And the Boyne Valley Food Innovation District is absolutely critical to making that vision a reality. I think the secret to success for the Food Innovation District is collaboration. And the same is true for your success in business. Collaboration within industry, between businesses and with academia and researchers can help unlock the full potential of what you are offering and deliver real impact for Meath and for job creation in the county. It is through your success over the past few years in business that has seen more jobs created in Meath. The national unemployment rate is now at 6%, and it continues to drop. 4 out of 5 jobs created in the last 12 months have been outside Dublin. Thousands upon thousands of jobs created by small business in Meath. I want to thank you for your work, for developing your business and for your dedication to job creation in Meath. I want to thank Meath Enterprise, Meath LEO, the IDA, Enterprise Ireland and all the State Agencies for working with you when needed. I have no doubt that if work together we will drive your business, our county and the Boyne Valley Region well on its way to being at the cutting edge centre of innovation & job creation in the 21st Century. Together we will make Meath a great place to live, work, and build a brighter future for our children. The ageing of our population is of prime significance to Government and presents challenges and opportunities on many levels. By 2045, it is projected that there will be double the number of 65-year-olds in this country, and we need to make sure that we plan for and cater for our ageing population. We must recognise the critical role played by older people in society, many of them with skills and expertise already in short supply, who must be given every opportunity to contribute as active members within their wider community. We must also seek to increase and enhance the opportunities for active participation. The quality of life of the older members of our communities is something that concerns us all, and demands a cohesive, inclusive and comprehensive approach at all decision making levels. A vital element of the quality of life of older people lies at the decision making at local authority level. This is the level that is in immediate contact with the community, and indeed is part of the local community. Decisions made at this level greatly determine safety within local communities, the quality of accommodation and the physical environment, service provision and the accessibility to these services. Such services are of limited use without the means to access and utilise them, and this is true for all members of our communities. In planning to make our communities age friendly, we also meet the needs of many other service users. The planning of such services is vital, as poor decision making can have the counter effect of causing rather than solving problems. Of course appropriate decision making and planning will benefit many service users, and it is critical that local authorities take the key leadership role of bringing together relevant agencies and service providers. Central to the planning of such services is consultation with services users, involving them in the decision making process. The establishment of Older People Councils has ensured this consultation, and has allowed plans to be developed and agreed locally, providing inclusion, involvement and accountability for all key stakeholders. This approach represents local government at its best and it is a prime example of giving effect to the need for integrated services through thorough engagement and planning. It is Government policy to support older people to live independently and with dignity in their own homes and communities for as long as possible. While acknowledging the effect that this can have on reducing reliance on health and social services, the benefits to the individual in terms of well-being and community inclusion are of equal, if not greater importance. After all, it is the individual who is the heart of the community. It’s really about making Ireland a great place to grow old. In terms of my own brief, older people have specific housing requirements, including proximity to family and social networks. Access to public and other essential services, recreation and amenities is also vital. Therefore, there is a requirement for a range of housing choices and options to be made available to older people, involving a cross Departmental, multi agency approach. Following a housing summit two years ago, an inter-agency Housing Working Group led by Age Friendly Ireland set out to explore the options to better accommodate older people within their community rather than in residential care. They carried out extensive research, workshops with older persons, and there was active collaboration between stakeholders including the Irish Council for Social Housing, the HSE, the Department of Health, Dublin City Council and my own Department. Among the recommendations put forward in the Report is the development of a pilot project of 50 – 60 dwellings suitable for the elderly. A steering committee has already been formed to oversee progress. It is intended that the collaborative process, leading to the commencement of the project, will set the standard for roll-out of future schemes. Of course, the challenge will then be how to take local models of good practice to a wider network, in a way that consistently applies age friendly initiatives. Key to this is innovation, and developing adaptable and smart homes to support assisted living for older people in their homes. In this context, the Action Plan for Housing and Homelessness committed to supporting a design challenge to provide solutions for older people within the built environment. As mentioned, the challenge for all of us is to ensure cooperation and teamwork between service providers. An example of this is the case of the Age Friendly Programme, which provides a real opportunity to transform communities in a positive and collaborative environment, to make them as age friendly and inclusive as possible. The programme allows us to learn from each other and be better placed to deliver the services older people within our communities deserve. We all need to be involved in taking the strong foundations of the community and building on them. It is, without a doubt, the people that make a community work, as the old Irish saying goes ‘Ní neart go chur le chéile’ – there is no strength without unity! Together, we need to build and perpetuate that vital sense of community that has and always will be the bedrock of Irish society, whether that is through leading, or supporting those leaders, towards the development of age friendly communities throughout Ireland and across Europe. Community Development, Michael Ring TD. extension of library opening hours. public libraries here this year. and enhancing the range and quality of services available to users. services offered by the libraries. branch to branch collection and delivery. I am delighted to be here today with my colleagues, Mr. Simon Harris, Minister for Health, Mr. Michael Ring, Minister for Rural and Community Development, Mr. Shane Ross, Minister for Transport, Tourism and Sport, Mr. Paul Kehoe, Minister of State at the Department of Defence, and Mr. Kevin “Boxer” Moran, Minister of State for the Office of Public Works and Flood Relief and to be associated with the Be Winter Ready campaign, now in its sixth year. I am delighted to see how the campaign has developed and grown over the years. The campaign aims to provide advice to individuals, communities, and businesses to enable them to prepare for the coming winter. 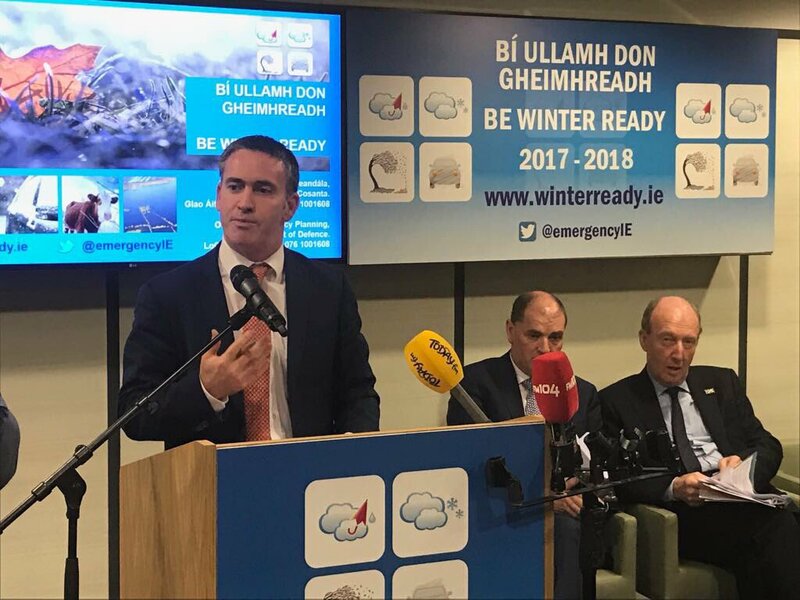 The value of this preparedness and the importance of providing accurate information and advice to the public was demonstrated as recently as three weeks ago when Storm Ophelia impacted the country. This weather event was unprecedented in its potential impact and severity and precipitated the issuing of a RED LEVEL weather warning for the entire country, the first time this had ever been done. Tragically 3 people lost their lives during the storm. However, I have no doubt that this number would have been considerably higher without the timely and accurate information and advice provided by the public authorities that enabled people to take action to protect themselves and their property. The preparedness and resilience of individual citizens also had a great part to play in this and in how quickly communities recover from severe weather emergencies. During and following the storm communities and individuals worked together with the Principal Response Agencies, demonstrating remarkable resilience and resourcefulness to further bolster the response effort. Initiatives and campaigns such as Be Winter Ready contribute enormously to this preparedness and the quality and accuracy of the advice it contains enables this combined effort and helps build trust in the public authorities. Speaking of preparedness, it is also important that we are ‘Winter-Ready’ with regard to homeless rough sleepers. Preparations are currently underway across all the major urban local authorities to ensure that additional safe and secure accommodation is available for rough sleepers during any periods of cold winter weather. Approximately 200 new emergency accommodation spaces will be in place before Christmas. These are additional bed spaces available for single homeless persons which will remain in the system for as long as they are required. My Department is assigned the Lead Government Department role for the response to severe weather events and takes on the task of convening and leading the National Emergency Coordination Group, which brings together the entire panoply of Government, when severe weather events, such as flooding, occur. My Department convened a National Emergency Co-ordination Group for Severe Weather in anticipation of the arrival of Storm Ophelia. The Group continued to meet during the storm and in the days following to bring a “whole of Government” response to bear in dealing with this crisis. My Department is now undertaking a wide-ranging review of the response to Storm Ophelia so that lessons can be identified to further refine and improve how we respond to other emergencies that will occur in the future. The review will engage key stakeholders and representatives of all organisations involved in the response at both national and local level will be invited to participate in a number of debriefing sessions that my Department plans on holding over the coming weeks. We have just concluded a meeting of the Government Task Force on Emergency Planning which dealt with winter-preparedness and where a comprehensive briefing was provided from across the range of Government Departments and Agencies. My colleagues and I are jointly launching this campaign to emphasise the ‘whole of Government’ approach that is in place. The main message is simple; be prepared, stay safe and know where to find help if you need it.